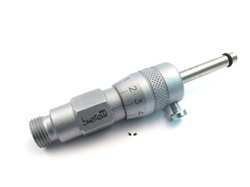 use for any 14mm spark plug two stroke engine timing. Timing is accurate af. probably more accurate that is even needed on mopeds lol. I love it. Got a cheap one for 20 bucks that snapped on me and gave me incorrect measurements causing many headaches. Decided to bite the bullet and get a nice one that will last me a lifetime - this works great and feels like it will last a while. This thing rocks! highest quality ignition micrometer on this site IMO. Probably the most accurate one also. No issues with the set screw or 14mm threads. Accurate and easy to use on. Just set it and forget it! Also, drilling a divot in the slidey bit, to use it as a piston stop was a bonus! i time my moped with a sundial and a stopwatch.